What is my favorite snake? The one the hawk just carried off. If you’ve been reading my stuff for any length of time, you know that I am not a fan of sweating, physical exertion, dirt or being attacked by reptiles. All of those things disqualified me from any thought of participating in Florida’s 2013 Python Challenge, but they don’t lessen my fascination with people who throw caution, comfort and sanity to the wind to get down and dirty in their quest to achieve their goals (even if said goals are, well, crazy). Last month I introduced you to the Challenge (see Florida is Being Invaded, The Squeeze is On), so I thought it only proper to bring you the results. You can click on http://www.pythonchallenge.org/ for more of the story, but I’ll highlight a few facts for you. At this point, you are likely asking yourself two questions. Number one – With only 0.0425 snakes caught by each of those participants, how did they manage to piece together 68 snakes? Number two – How happy is the FWC with only a handful (they have very large hands) of snakes removed from the Everglades? I’ll ignore the first question and go right to question number two. The Florida Fish and Wildlife Conservation Commission (FWC) is pleased as punch with the information gathered through this challenge and isn’t complaining (out loud) about the teeny-tiny number of pythons wrangled. Also, since a female can lay 50-100 eggs, the FWC can be assumed to be hopeful that the majority of those snakes harvested were girls. This may beg the question, how do you determine the gender of a snake? My answer, I don’t. Meanwhile, back here in Orlando, I have had my own reptilian encounter, which you will no doubt agree parallels the thrill and adventure of those in the Python Challenge. It was a typical balmy February day. 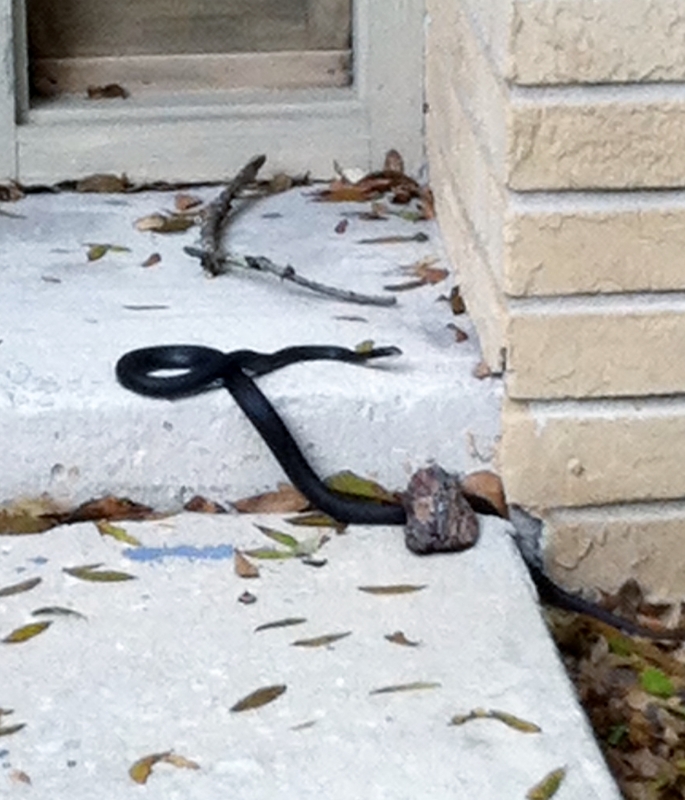 I opened my front door to head to the mailbox and came face to face with a terrifying spectacle – no, it was not girl scouts selling those irresistible thin mint cookies; it was a black racer. “Oh, a friendly snake! How nice that it’s laying on my front step,” I thought to myself, but what came out of my mouth was, “Aaaahhhhh!” as I quickly retreated into the house and slammed the door. I gathered my composure and my cell phone and headed out the side door to assess the situation. I gave the snake a wide berth as I circled my yard and ambled toward my front door. There he was, waiting for me. Now, all I ask of the wildlife in my yard (except for birds and bears, of course) is that they be more afraid of me than I am of them, and he wasn’t cooperating. We had a face off. I stared. He stared. I took a step closer. He didn’t budge. In fact, he seemed to be posing for photos. Considering this is a Black Racer, he wasn’t in any hurry at all. I did the only thing I could do – I threw a stick at him. I didn’t want to hurt him, but clearly I needed to make sure he knew who was boss (he did – it was him). I’m a terrible throw and clearly he was not intimidated. I gathered my courage, took one more step in his direction, and heaved a piece of cypress mulch at him. It landed perfectly – leaning against his slender body, which was still on my front step. He looked at me and stuck out his tongue. I stuck out my tongue. It was going to be a long afternoon. Thankfully, a person standing in the middle of her yard staring at her front door for 15 minutes does attract a certain amount of attention. My neighbor, John, came to my rescue wielding a round point shovel and an attitude worthy of hunting down even a Burmese python. The snake took off and was gone in a flash. Gone but not forgotten. It’s been a week now and I still have a feeling he’s out there ready to taunt me again. That’s why if you come to my front door, please don’t disturb the shovel I have propped up against the wall there. It’s cheap insurance against a wily old snake. Florida is Being Invaded – The Squeeze is On! In case you’ve been wondering if there is anything exciting and/or controversial going on in Florida that might also be worthy of being made fun of, wonder no more. On Saturday, January 12, Florida kicked off a real nail-biter of a challenge. It is being covered by the news, but not nearly enough for me; so I thought I’d better make sure that you aren’t missing out on this huge story. You may or may not know that Florida has a problem with many invasive, non-native species. Lionfish, Muscovy ducks, Cuban tree frogs, and Hulk Hogan are a few of our more popular ones. But none, not even Hulk Hogan, can cause the stir that the Burmese Pythons are creating in the Everglades right now. In layman’s terms, the snakes are eating everything in sight. They are putting the squeeze on our native mammals, birds and reptiles. They are wreaking havoc on our ecosystem. Anyway, there is a prize for the highest number harvested (killed) and a prize for the largest one harvested (killed), too. Anyone 18 or over that has an extra $25 can enter. And 16 and 17 year-olds are welcome when accompanied by a registered parent. So, what are you waiting for? Head on down to The Everglades; grab your machete, guns and Off! and come on. We really have it all down here. And, talk about a deal – that price is approximately the same as two days of parking at any of the major theme parks. You are probably starting to plan your trip right now and no doubt asking yourself, what can I use to harvest (kill) those big boys? The trickiest part of shooting the snake is finding the correct spot to target. They instruct the hunter to make an imaginary line from the rear of the head on the left side to the right eye and then do the same on the opposite side of the head. The point of intersection is the target. I can only imagine myself finding a snake and trying to draw those lines in my head before I blow the thing to smithereens. I guess it’s a good thing I’m not out there. Figuring out how to follow the hunt on twitter was challenge enough for me. They are also on board with using a machete to decapitate the snake, though you can tell they aren’t quite as happy about that, what with the chance that a clean cut may not be made and the ravenous, invading snake that has so compromised our state’s ecosystem might not be killed with one fell swoop. Not to mention the fact that if you chop the snake up into more than two pieces, it will not be eligible for the longest snake award. I’m not making that up; it’s in the official rules. Your next question is likely, who came up with this plan to send seasoned hunters and novices alike into the wild to grub for twelve-foot reptiles? It’s the Florida Fish and Wildlife Conservation Commission (FWC) and its partners. These guys love an opportunity to have dozens of armed people descend on the Everglades for an old-fashioned snake hunt. I think it’s a great idea, too, though I will not participate due to the fact that I am really pretty wimpy and don’t like to sweat, be strangled by snakes, or attacked by alligators. If I want to be bitten by a mosquito, I don’t have to go all the way down there for that. And if you’re thinking about stacking the deck by planting a python or two for you to “harvest,” think again. That’s a no-no. According to the official rules, harvesting a python that was formerly a pet gets you disqualified. That rule is a bit ambiguous to me because the python problem is largely a result of people letting their pet pythons go in the wild when they became too much for them to handle. Yes, all kittens, puppies and baby snakes are adorable (not! ), but they do grow up. Think, people, before you purchase that exotic animal! Talk about buyer’s remorse! As of this writing the count of pythons stands at eleven, but it’s early. Every Friday and Tuesday the official website will be updated. You can click http://pythonchallenge.org/ to keep up with it.